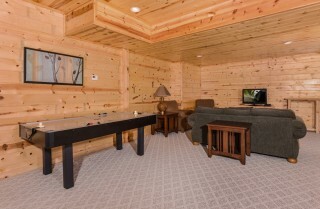 Welcome to A Suite Escape in the Great Smoky Mountains! 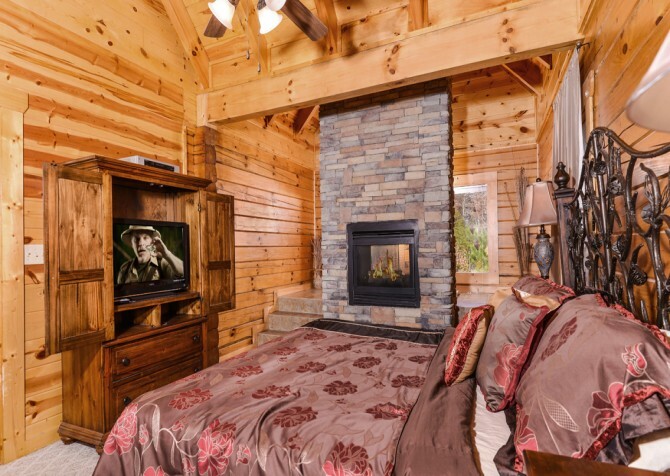 Located just over 1.5 miles from downtown Pigeon Forge, this charming 3-bedroom, 3-bathroom cabin for 8 boasts a beautiful log exterior and interior plus entertaining spaces throughout, a fully equipped kitchen, and 2 master suites with their own indoor jetted tubs and stone fireplaces. 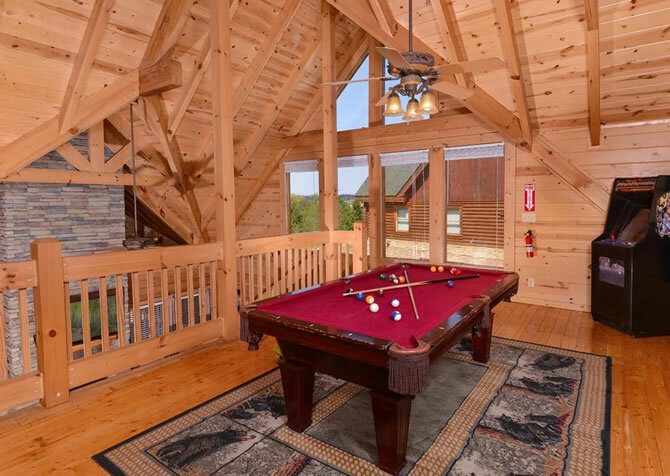 Spend quality time with friends in the game loft, whip up homemade meals in a flash, enjoy family films in the media space or take advantage of the wireless internet, unwind in the outdoor hot tub, and snuggle with your spouse in a king-size bed. Designed with the mountains in mind, A Suite Escape offers an open and airy feel inside and out, providing a relaxing home in the Smokies for your couples’ retreat, getaway with friends, or family vacation. 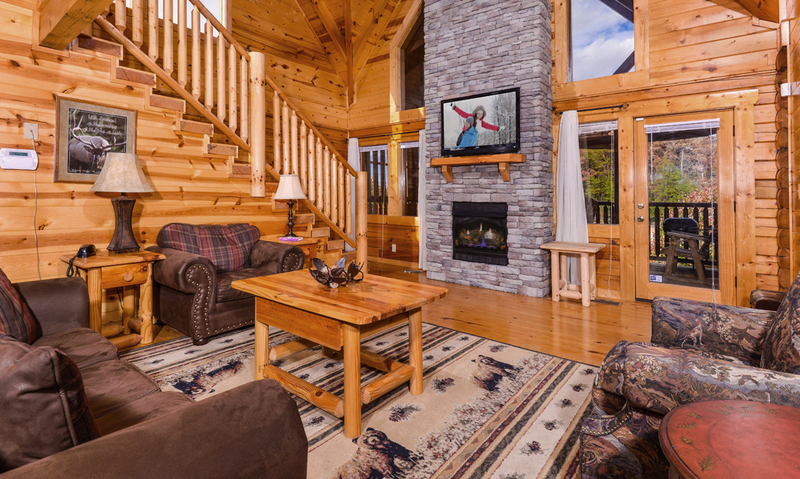 Entering the great room, you’ll immediately feel warm and cozy, with a plush sofa, 2 comfy arm chairs, a large area rug, big screen TV, and a beautiful stacked-stone fireplace. Kick back and watch a comedy classic when you arrive to unwind after your travels or take in the lush woodsy and serene sky views through the large windows. On winter nights, get a toasty fire going in the gas fireplace and let the dancing flames carry away all your worries and cares. 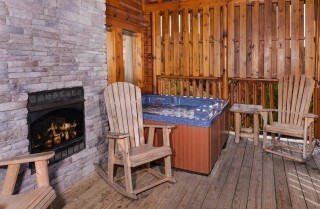 Add a good book and a glass of wine into the mix, and a relaxing evening in the Smokies awaits. Furnished with all the cookware and necessary appliances for delectable homemade meals, the fully equipped kitchen at A Suite Escape is more than ready for your favorite recipes. Stop by one of the local grocery stores or farmers’ markets to pick up fresh ingredients and prepare one of your famous dishes! Not up for meal prep? Order in! The fridge will be more than happy to store any leftovers, and the freezer is a great place to save desserts. Once mealtimes are over, easily switch on the dishwasher to take care of the mess. Oh, and let’s not forget everyone’s movie-night favorite in the microwave! When mornings arrive, fix a pot of joe in the coffeemaker, fruit smoothie with the blender, and a hot breakfast on the stove — a great way to prepare for fun activities in town. Easily serve bountiful breakfasts, lunchtime spreads, tasty dinners, and delivered pizza in the dining area, conveniently located in the center of the kitchen. Grabbing seconds has never been easier, and the large table for 6 has plenty of room for sides and condiments. 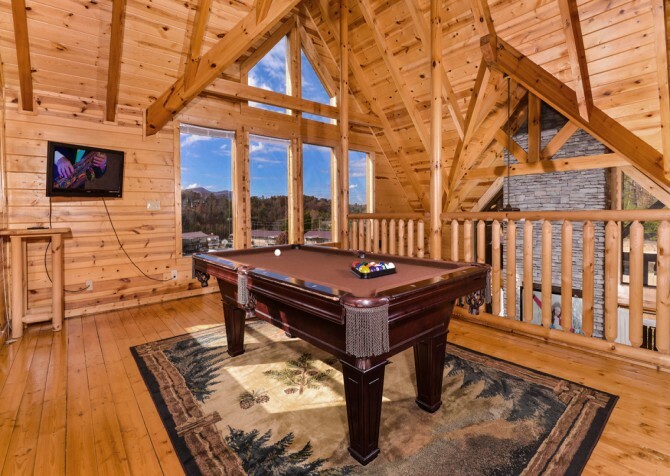 Not to mention the space is perfect for planning your Pigeon Forge excursions, checking emails, reading newspapers, and busting out a board game or a puzzle for a bit of fun from home. Ready for even more excitement? 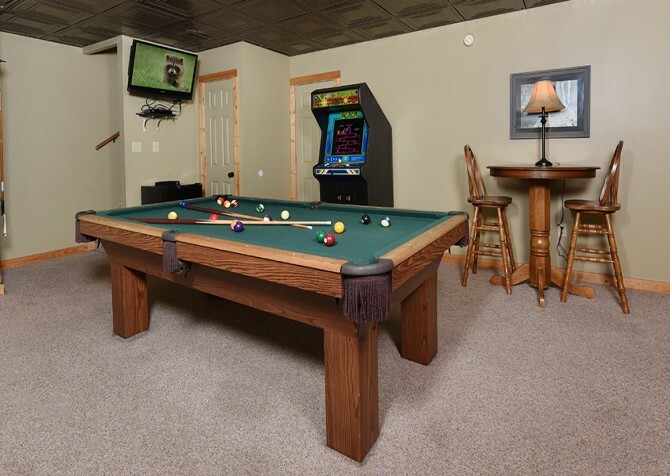 Head upstairs to the loft and discover the recreation room — harboring a full-size pool table and mounted flatscreen TV. 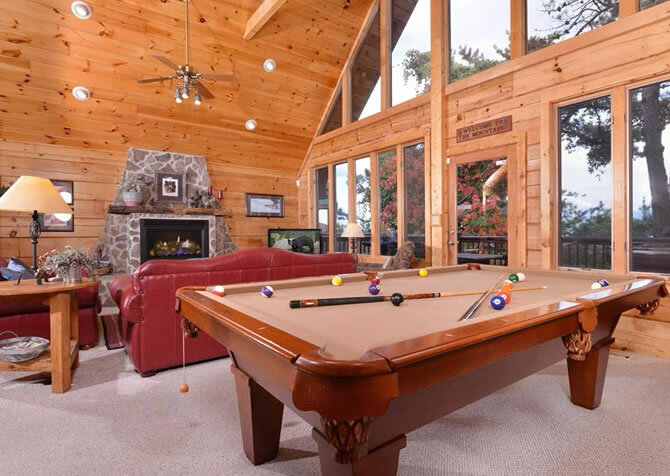 Join friends in a rousing round of pool or simply support your favorite player in a heated match. Don’t worry, the ceiling fan will keep everyone cool. After the pool champion is crowned, challenge them to an air hockey tournament downstairs. Better yet, let them enjoy their victory for a while by hosting movie night in the media space — complete with a flatscreen TV, DVD player, plump sofa, and 2 arm chairs. Pile snacks and drinks on the coffee table, sit back, relax, and press play! 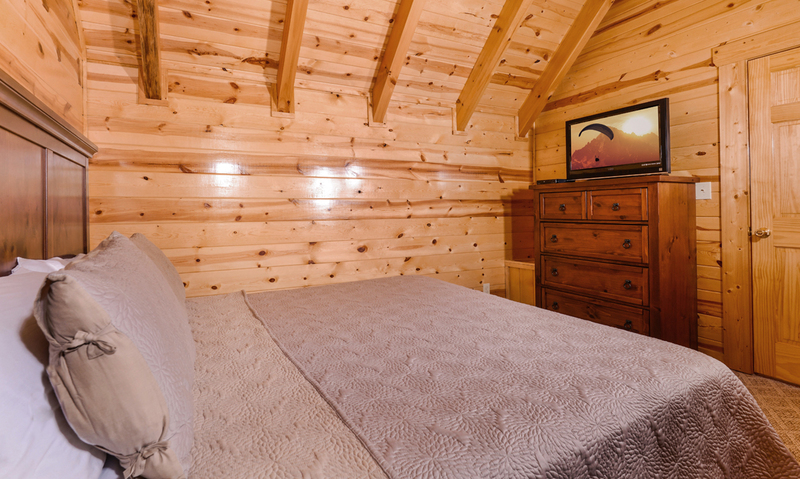 Best of all, there’s a twin bunk bed nearby, which means carrying the little ones to bed won’t be a hassle. And this space is fully carpeted, meaning roughhousing youngsters can get out all their wiggles with ease. 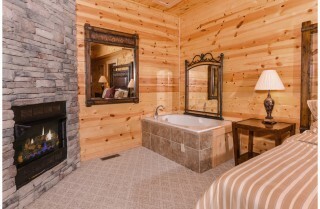 Rightly dubbed, A Suite Escape offers 2 master suites with plush king-size beds, flatscreen TVs, indoor jetted tubs, and gas fireplaces with stone features. The largest of the suites offers a double-sided fireplace, allowing you to enjoy the crackling flames from the comfort of your comfy bed or as you soak in the jetted tub. And the 3rd bedroom harbors a king-size bed and flatscreen TV, so everyone can enjoy restful nights’ sleep. 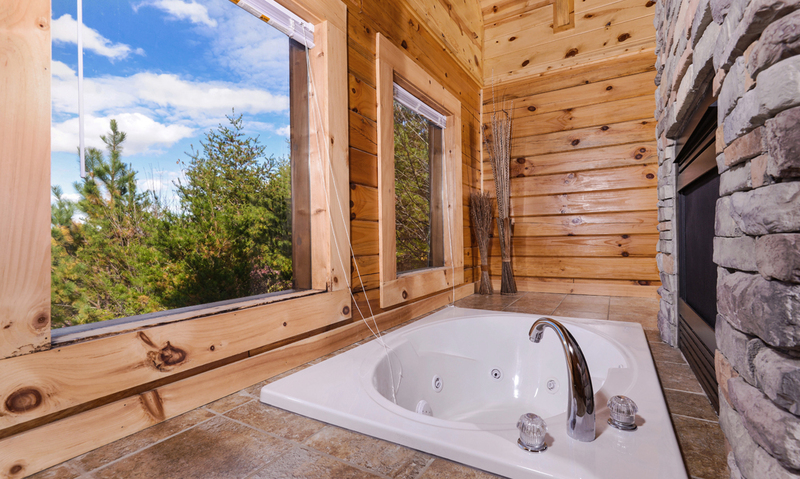 There are also 3 full bathrooms, 2 with stand-up showers and 1 with a shower and tub combo, which means getting the whole family ready for bed will be a breeze. The perfect place to take in the fresh Smoky Mountain air, the covered deck boasts quaint rocking chairs, a relaxing hot tub, and even an outdoor gas fireplace. Sway away with a glass of sweet tea in summer, unwind in the warm bubbles after a long hike through the Great Smoky Mountains National Park, and chat with your bestie with a mug of cocoa by a warm fire on cool nights. 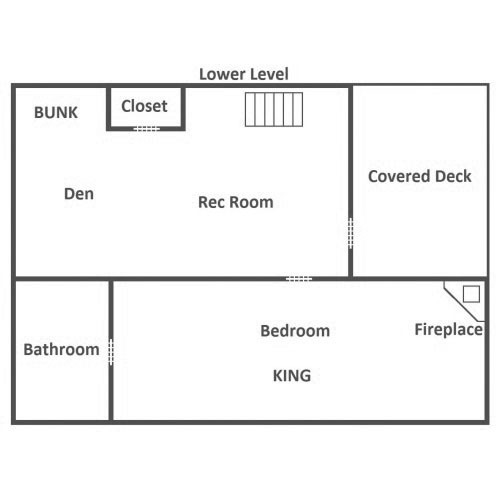 When you arrive to A Suite Escape, park up to 4 vehicles in the flat, paved parking area (motorcycle friendly), step up about 3 steps to the front porch, and take a load off on the convenient bench. With such easy access, unpacking and reloading the cars will feel effortless. 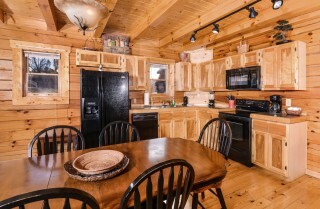 Looking for a fun first meal at the cabin? Fire up the charcoal grill for a barbecue party to start off your vacation with a bang! 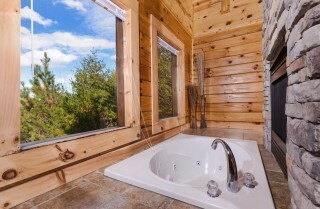 What else does A Suite Escape offer? 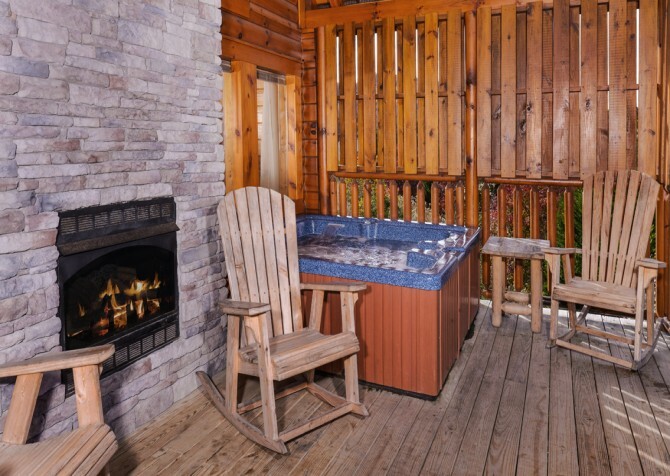 Well, there’s the washer and dryer to keep your luggage light and fresh and high-speed wireless internet to give you full access to local deals and events. Oh, and this cabin retreat is also pet friendly, so you can bring Fido along for new smells, intriguing head tilts, and tasty treats from town! Less than 2 miles from downtown Pigeon Forge, A Suite Escape is ideally located for guests wanting to see the best of the city. In just minutes, you'll be in the middle of all the excitement — dozens of delicious restaurants offering a variety of cuisine, family-friendly attractions, hilarious dinner shows, games, local events, and much more! Got an eye for crime? Check out the Alcatraz East Museum, where you’ll find 5 galleries filled with criminal investigations of all kinds, from infamous pirates to modern-day lawbreakers. Speaking of law breaking, see if you can break out of prison at The Escape Game. Or maybe you’d prefer to switch rolls and catch an art thief before time runs out! Ever dream of skydiving but always freeze up before you try? Then Flyaway Indoor Skydiving is just the place for you! Skydive safely indoors with an instructor by your side to keep your mind at ease. 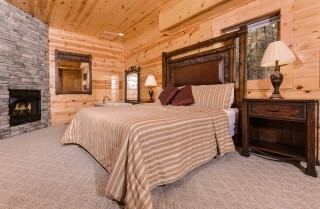 "We try to stay in A Suite Escape each trip due to the location which is less than a mile from the parkway. 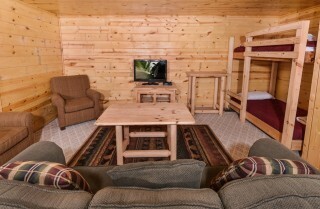 This cabin has always been clean and ready for our arrival without any issues. 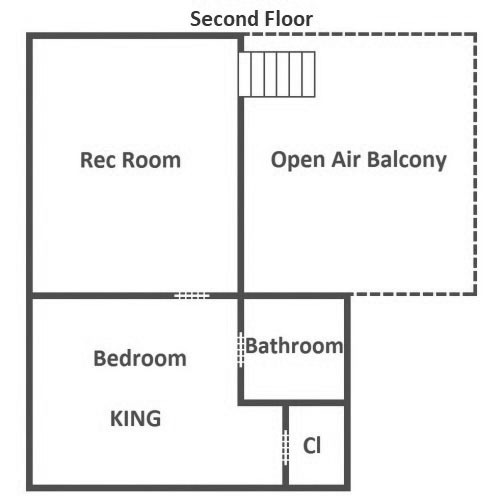 In 2016 my class ran late and I…"
"We try to stay in A Suite Escape each trip due to the location which is less than a mile from the parkway. 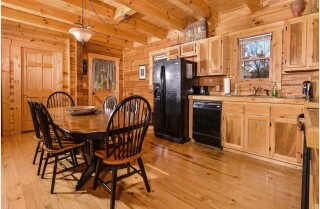 This cabin has always been clean and ready for our arrival without any issues. In 2016 my class ran late and I arrived about 30 minutes past checkout to pick my family up and the cleaning crew was parked across the street waiting. I walked over to apologize and was met with very polite no problem take your time from both ladies. 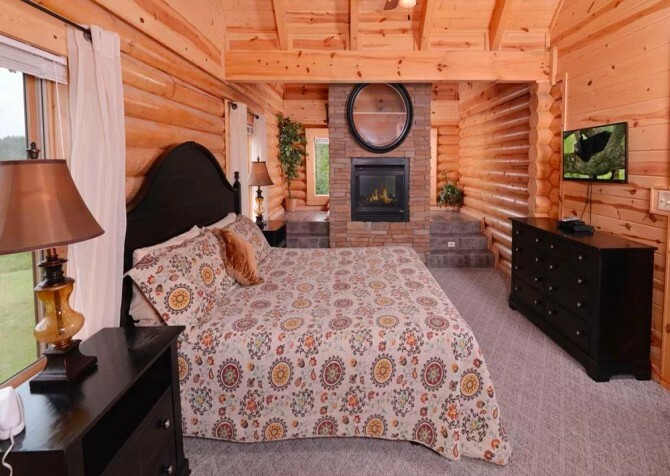 A Suite Escape is wonderful and I would recommend this cabin to anyone anytime other than the second week in November stay away that week lol." Thank you for sharing your great story from 2016 and for recommending A Suite Escape! We look forward to serving you with even more incredible stays in the future as we're always looking for ways to improve. Visit us again soon! 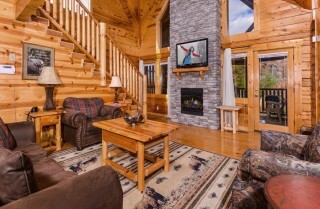 "The only downside to staying in the cabin was our short visit! We loved it. Beautiful and convenient." We couldn't be happier to hear how much you enjoyed your stay! We so understand how hard it is to leave a cozy Smoky Mountain cabin. We can't wait until your next visit! 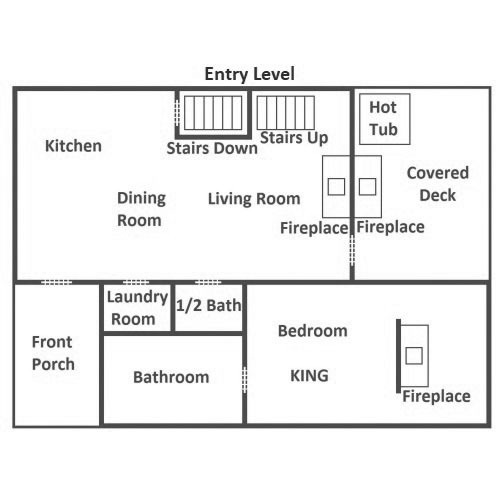 "Tons of space and fantastic location. 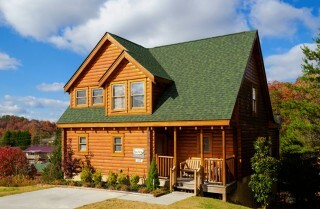 Close to everything in Pigeon Forge!" Fun & Games at The Track!